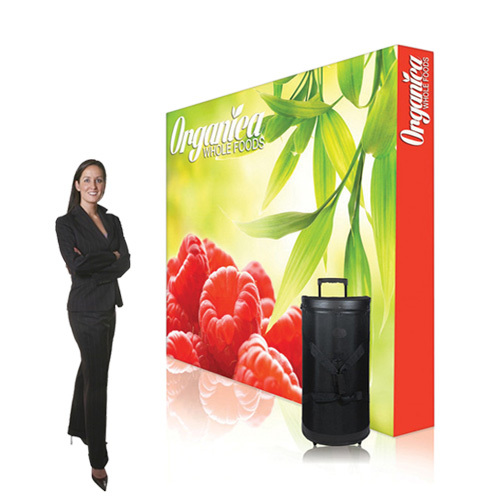 Ready Pop stretch fabric displays are made from ultra lightweight aluminium with an attractive mate satin anodized finish. Stretch fabric graphics are ideal for trade shows, exhibitions and conference. Pop up booth displays are versatible and take less than 10 minutes to set up. Fabric graphics stay attached with velcro, making it convenient to set up and take down even faster. The Ready Pop is the FASTEST booth to setup, clocked in at just 2-minutes! Shipping Dimensions 36" x 18 " x 16"
Ready Pop 150 Watt Halogen Flood Light For Ready Pop Up Displays Excellent illumination source an.. Stretch Fabric Graphic for 10ft Straight Ready Pop Display Custom Printed Single Sided Banner This.. LED Light for Ready Pop Trade Show Pop Up DisplayStylish and compact LED lights for our portable Re.. Stretch Fabric Graphic ONLY for 10ft Curved Ready Pop Custom Printed Tension Single Sided Graphic T..